The Socorro County branch of the New Mexico Archives Project, which is in turn an extension of the USGenWeb Project, has a fairly sizable archives listing online which includes birth and death records, military service, personal and family biographies and histories, cemetery and census records, and much more, with some of the provided documents dating back to the mid 1800s. The Archives also provides the New Mexico Death Index Project which provides the death index for the entire state dating from 1899 to 1949. 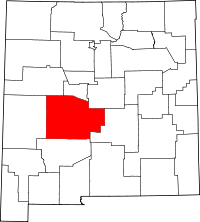 The County Clerk is in the county seat of Socorro, NM, and serves as the official indexer of marriage, property, and a number of other types of records. Birth and death records are maintained for the entire state by the Dept of Health in Albuquerque and are provided to qualified individuals. The Dept accepts certificate applications either in person or through the mail.